Tooth decay, when in the initial stages, can be cured by simply removing the infected portion of the tooth and filling the cavity with suitable restoration materials. When the bacteria have reached the pulp of the tooth, an endodontic treatment will be necessary to save the tooth. The infection of pulp may result in a toothache and tooth discoloration. The endodontic treatment ensures that the tooth is free from infection and it is restored with suitable dental material. Endodontics is that branch of dental medicine which is dedicated to studying of diseases and treatments of the inner portion of the tooth. This includes the pulp, the root canal chamber and the root of the tooth. Are you suffering from a toothache? It is important for you to visit our dental office at Cathedral City, CA at the earliest since you may be at higher risk of losing the tooth. 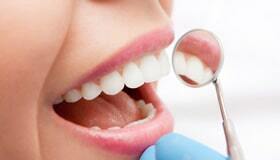 At our office, we perform a wide range of dental procedures that can relieve you from and cure the infection. When and why is endodontic treatment necessary? To understand the necessity of endodontic treatment, one should know the different parts of a tooth. Our tooth has an external layer named enamel, under which there is dentin and then the pulp. The enamel is made of strong minerals. The pulp has nerve tissues and blood vessels. The pulp is responsible for the healthy growth of the tooth. It supplies nutrition to the tooth. Once a tooth is fully grown, it may be able to survive without the pulp. When a tooth is decayed, bacteria form colonies in dental caries and feed on food particles to cause further damage to the tooth. When the cavity caused by tooth decay is deep enough to touch the pulp, the bacteria come in contact with the soft inner portion of the tooth and cause infection. 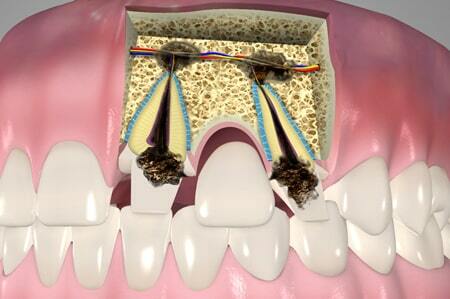 The bacteria spread through the pulp to the root of the tooth and to the supporting structure. If the infected part is not removed in time, the infection can lead to tooth loss. Endodontic treatment – How is it performed? There are different symptoms which can indicate that a pulp is infected. A toothache, discoloration of tooth and swelling of gums are some of the indicators. During your first visit to our office, we make a note of such symptoms and may take X-rays to know the status of the tooth. If we find that the pulp is infected, root canal process may be recommended. This process is performed with the help of local anesthesia. 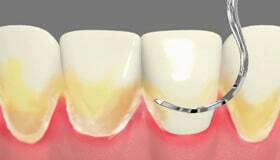 The first step in a root canal process is to isolate the tooth from surrounding teeth through a rubber dam. An opening is created in the surface of the tooth using drills. 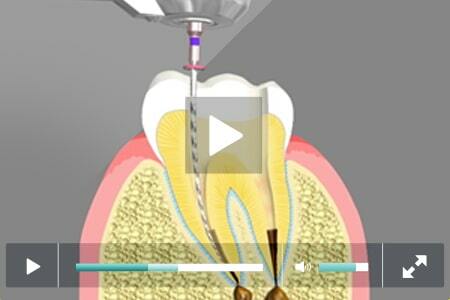 This creates access to the pulp chamber of the tooth. 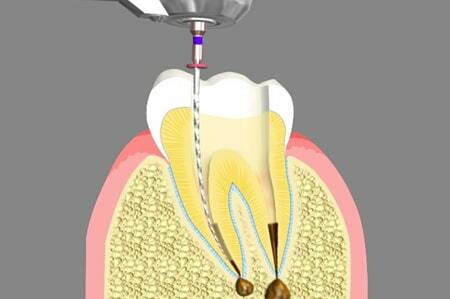 The infected pulp is carefully removed and the dentist cleans the root chamber with dental files. Anti-microbial agents may be used in the chamber to kill any remaining bacteria. The root canal is then sealed with appropriate material. Filling materials are used to fill the tooth. 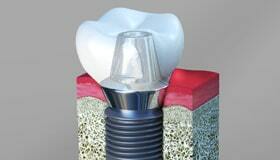 Finally, a crown is capped over the tooth to protect it from further damage and support its functions. 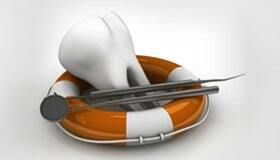 Root canal treatments can be performed by both dentists and endodontists. However, the treatment may have a higher success rate when performed by an endodontist. In some rare cases, when a tooth has failed to heal after a root canal treatment, endodontic retreatment may be necessary to enable quicker healing. There can be a number of reasons for the failure of healing. Following are some of them. Narrow or complicated canals were not treated properly during the first procedure. Delay of time in capping the tooth with a crown which may have led to salivary contamination of the inner parts of the tooth. Apart from the causes mentioned above, new infection in the supporting structure may also cause failure of healing. 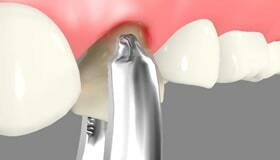 The crown and the filling material are carefully removed and the canal is cleaned using anti-bacterial agents. The canal is sealed once again and the tooth is restored. An endodontic surgery may be necessary in rare cases where the non-surgical procedure may not be sufficient to solve the problem. Apicoectomy is one of the commonly performed endodontic surgeries. This is done when there are infected tissues spread to the tip of the root. An opening is made in the gums and the bone and the infected tissue is carefully removed from the tip of the root. Our Endodontist fills the tip of the root with suitable material and the gums are sutured back. There are other endodontic surgeries which include sectioning of the tooth, removal of roots and repair of roots which may be required rarely.